One of the biggest selling items in my nursery art store WallFry are the custom, personalized Wall Letters. They are different from a lot of the other wall letters for children, in that you only need one! They are perfect for hanging on the door to a child's room (this is where I have the letters for each of my boys) as a name sign, above a bed or even sitting on a shelf. Papier Mache letter - in Australia, I buy mine from Spotlight, but similar letters can be purchased from any number of craft stores including the Hobby Lobby or Joann. Colorful paper - there are some beautiful gift wrapping papers out there which work really well. I also use vectors which I can match to my customer's decor and print off myself. 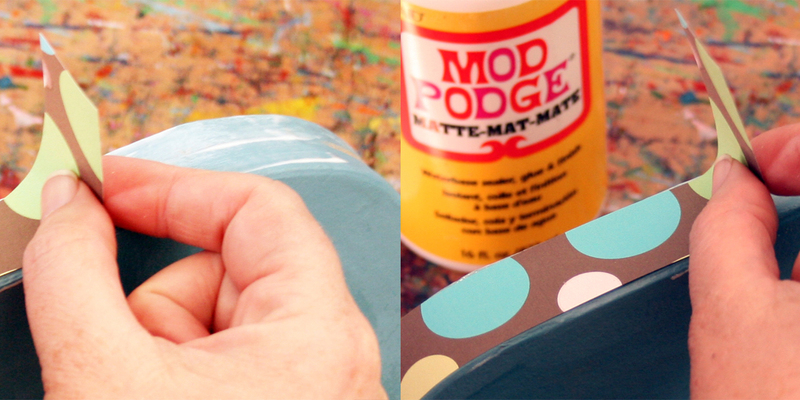 Mod Podge - this like a decoupage/glue sealant that I use as an adhesive and sealant for protection. If you know a similar product then you are welcome to try it. I use the matte. Acrylic Paint - in the colors of your choice. Craft Letter Stickers - I use foam alphabet stickers that are actually intended for children's crafts. You can get something similar at any craft store. The first step is to paint your letter in the color of your choice. 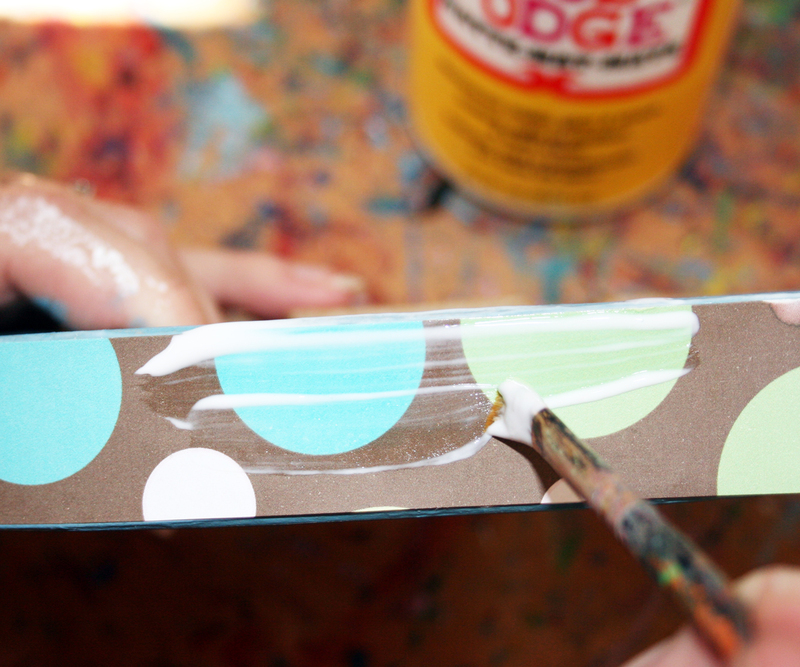 Paint both sides and once it is dry you can attach your paper to the sides. I use Mod Podge for this (although I am sure you could use any crafting glue). 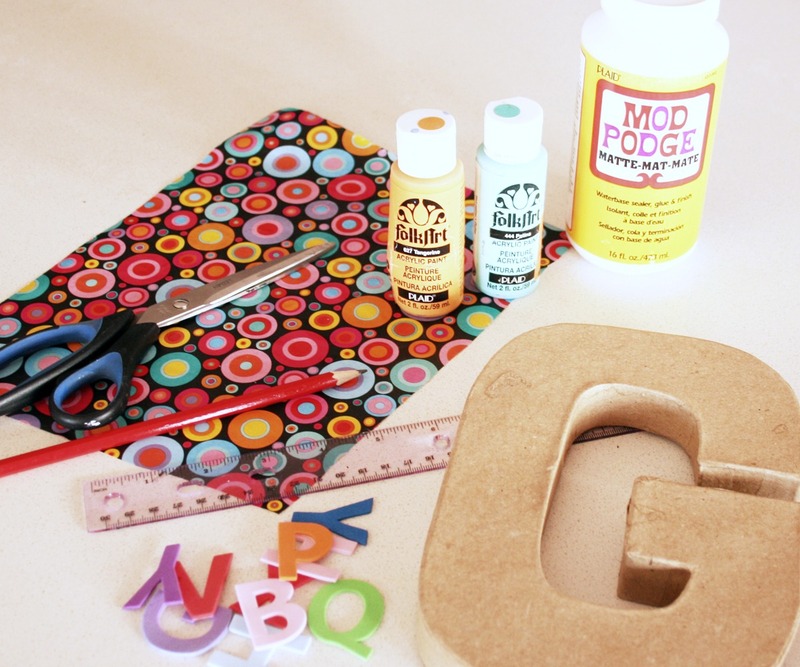 Once the Mod Podge is dry, you are ready to attach your letters for the name. Peel off the backing first (if there is one) and glue it on. 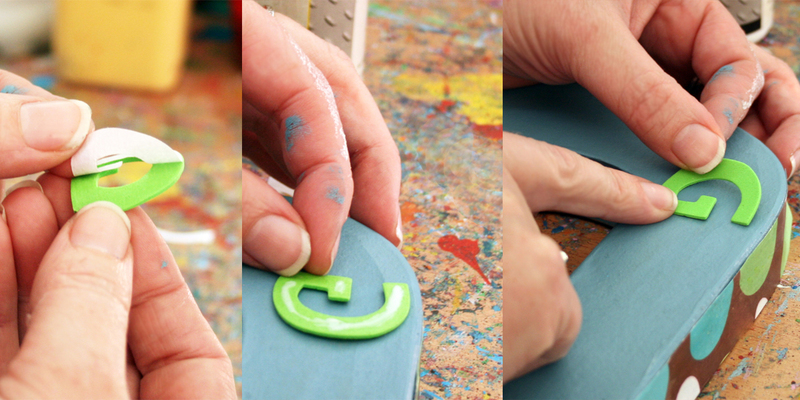 TIP - even though the letters I use are stickers, I secure them on firmly using a PVA glue. 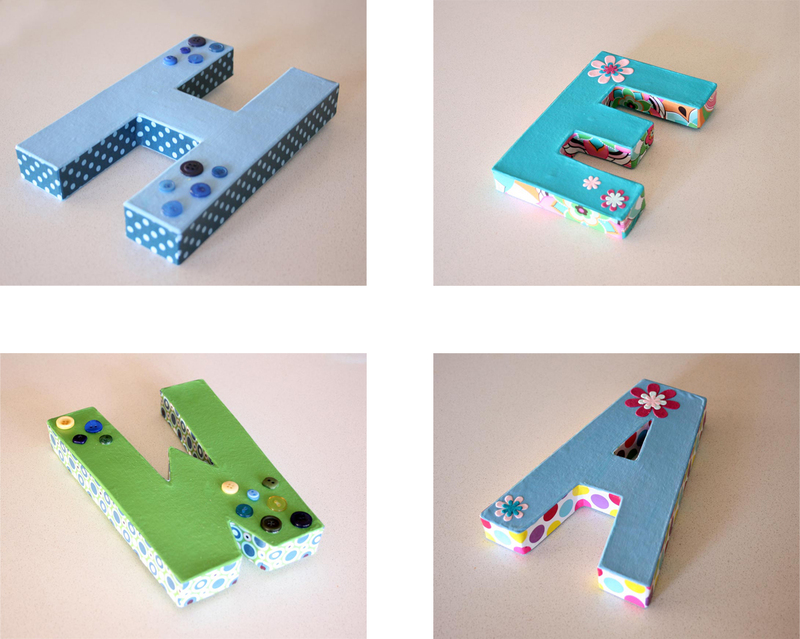 TIP - These types of foam letters come in a range of colors, but if yours don't match the color scheme that you have chosen, you can paint them in advance using acrylic paint. This can be a little fiddly so if you can get away with the letters as-is then I encourage you to do so. 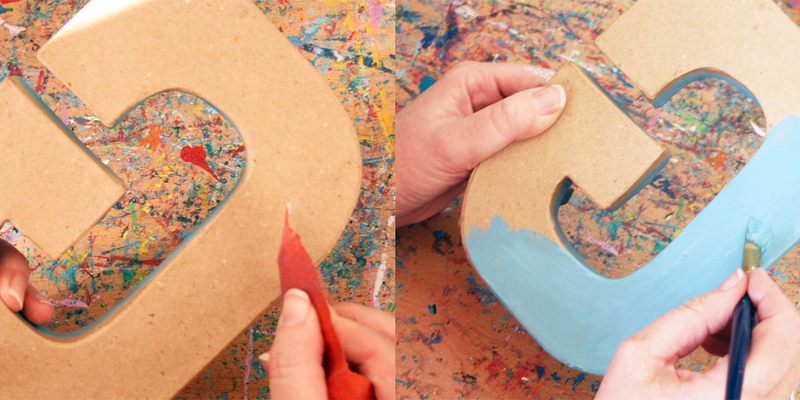 I do paint the foam letters most of the time, to get the best color match. I then paint the foam letters with Mod Podge for extra protection but this is not necessary unless you want to. I sell them with a small 'A' hook at the back but don't find it necessary for the ones that I have used in my own home. As they are very light, I adhere them to the wall with Blu Tak (removable adhesive putty). Thank you thank you thank you for this idea! I love modge podge and any ideas that go along with it. I just tried this as a house warming gift for my sister and brother-in-law, using colors from her decor theme with their last name (not exactly for a child's room, but I still love the idea!). It turned out great! I love it as a housewarming gift - Great Idea! You could also use it with inspirational words like DREAM on the letter 'D' or PLAY on the letter 'P' for a playroom etc, so many options. These are a lovely idea! I salute the ones who made these personalised wall letters. I've been persnalising stuffs. Since I was a kid, I've personalised stubby holders and now I'm making money out of it. Does your Art match your Nursery?